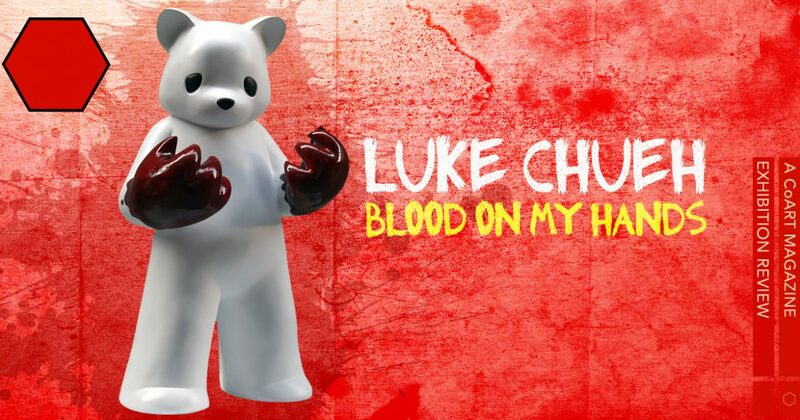 Referring to his reoccurring character, Luke Chueh proclaims, “Yes, I am the Bear.” And for those unfamiliar with Chueh’s autobiographical form of imaginative art, that insight is an important starting point. Gazing upon the selection of works assembled for Chueh’s first solo exhibition in the Philippines, Blood On My Hands, it is obviously meant to be an introduction into his oeuvre. Classic Chueh concepts are made new again in this showcase, his visual language spelled out within the Secret Fresh Sky Gallery. And the Rosetta Stone to Chueh’s artist vocabulary takes the form of twelve paintings coupled with the debut of the artist’s newest sculptural shape, Red Handed (2017). Depicting a forlorn bear staring down at his blood-soaked, cartoonishly clawed hands, Red Handed is extremely reminiscent of an early success in Chueh’s career, Possessed (painting 2004, sculpture 2007). But there is a significant difference in that Possessed featured a diminutive devil at the helm of a video game controller that was plugged into the bear’s head, implying that the devil truly did make the bear do whatever bloody action he took. With Red Handed opting to omit that element, the image transforms into one symbolic of guilt, of regrets that stain one and can’t be washed away. It is, in essence, similar to the imaginary “spot” of blood that Lady Macbeth can’t seem to clean off her hands. Standing roughly 21 in. tall, the Red Handed resin sculpture debuted at Blood On My Hands in the above-pictured edition version, limited to 30 hand-painted pieces. In addition to these, which were the classic white bear with blood red hands, there was an assortment of one-of-a-kind renditions as well. For Blood On My Hands, Chueh hand-painted ten one-off Red Handed pieces, which resulted in an exploration of color combinations and symbolic meanings. For instance, orange tends to imply madness in Chueh’s art and green is associated with envy or greed, making the version of Red Handed done in orange with green “blood” on the hands emblematic of the bear going mad with envy. While most employed unique color schemes, a few harkened back to combinations Chueh is known for, such as the black/gold rendition and the one that is similarly colored to the editioned version though with gray shadowing added. In addition to the hand-painted one-of-a-kind versions, there were three unique chromed renditions in gold, silver, and red. And with a mirrored surface that reflects the viewer’s visage, these literally place the you in the artwork, emphasizing an empathy with the guilt-ridden bear. Chueh’s Blood On My Hands had its opening reception on Sunday, March 19th, 2017 at 6pm at the gallery’s physical location (Ronac Art Center, Ortigas Ave, San Juan, 1504 Metro Manila, Philippines).